Ancient writings on P3X-439 speak of an Ancient repository which could be similar to the device found on P3R-272. Hammond authorizes a mission to extract the device and return it for study, hoping that it will hold the key to the Lost City and technology that could save Earth from Anubis. As SG-1 searches the ruins, the repository device materializes, but when Anubis's fleet launches an attack on the planet, SG-1 can't allow the vital information to be lost, nor to fall into the hands of Anubis. With no option remaining, O'Neill places his head in the device, and the Ancient knowledge is downloaded into his mind. SG-1 hopes that the knowledge within O'Neill will reveal the location of the Lost City, but they know that unless a way is found to reverse the technology, the Ancient knowledge will overwrite O'Neill's brain and eventually kill him. Meanwhile, in Washington DC, Dr. Elizabeth Weir, an expert in international politics, meets with Vice President Kinsey and learns of the Stargate Program. She is even more astounded, however, when President Hayes, recognizing the political need to shift from military to civilian control of the SGC, relieves General Hammond of command, and offers command of the Stargate Program to her. As Dr. Weir attempts to come to terms with the immense task of running the SGC, Bra'tac arrives through the stargate bringing ominous news. Anubis is gathering the full force of his fleet and will arrive in three days. Weir meets with SG-1 and Bra'tac, as well as Kinsey, who scoffs at Bra'tac's warning. Kinsey threatens that Weir mustn't cross him, but Weir refuses to be a puppet to his agenda. She recognizes O'Neill's sacrifice, and agrees to allow O'Neill and SG-1 the time to draw on the Ancient knowledge in O'Neill's mind that could be the last chance to save the planet. As the knowledge of the Ancients that could save Earth begins slowly rewriting Colonel O'Neill's brain, random words from O'Neill provide a clue. Praclarush Taonas may be the Lost City they seek, but when SG-1 journeys to the distant planet, they find a world lost in fire beneath lava flows. 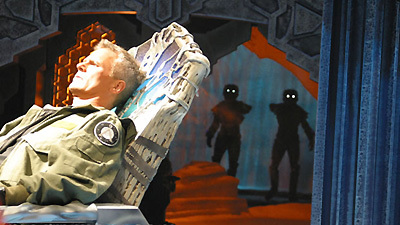 However, a preserved subterranean chamber holds a unique power source and a throne-like chair which O'Neill activates to create a holographic map that leads back to Earth. The key to the Lost City, "Terra Atlantus," lies beneath the ice of Antarctica. Anubis's fleet has arrived in Earth's orbit and has begun testing the planet's defenses. President Hayes meets with his advisors in the Oval Office, but without the Ancient technology, Earth is defenseless. As SG-1 returns from Taonas with the power source retrieved from the planet, O'Neill's condition grows more advanced. He possesses both the knowledge and the healing power of the Ancients, but has lost the ability to communicate. Kinsey attempts to relieve Dr. Weir of command, but the President dismisses him and supports Weir's recommendation to defend SG-1's ship at all costs. He launches Prometheus, with Hammond at the helm. As Prometheus and a fleet of F-302s engage Anubis's fleet in a mammoth battle above Antarctica, SG-1 rings down to a familiar chamber beneath the ice. With the new power source, O'Neill activates an identical chair, and summons the power of the Ancients. The ground opens, and a stream of thousands of flying glowing energy drones swarms to the surface and annihilates the enemy fleet. Earth has been saved, but O'Neill is near death. A cryogenic chamber encases him, but the small outpost provides no answers. O'Neill and the Ancient knowledge he possesses are lost, held in suspended animation beneath the Antarctic ice. This episode aired in two parts. President Hayes effectively shut down the SGC for a three-month review process during which a newly formed government department will take the place of Stargate Command. Hammond is relieved of command and replaced by Dr. Elizabeth Weir, a civilian and expert in international politics. Dr. Elizabeth Weir started her career as a political activist lobbying against the government�s spending on the military. She speaks five languages, including Russian. She mediated a negotiation in North Africa, and brokered a dozen of the most sensitive international treaties in modern times, including several for the UN. Hammond and President Hayes have known each other for a long time. Both were lieutenants when they last spoke. Kinsey brought in a lot of financing to Hayes�s campaign, and delivered Florida in the election. SG-2 discovered a colonnade on P3X-439 with Ancient writing. SG-3 (commanded by Colonel Reynolds) and SG-5 (commanded by Major Harper) provide backup for SG-1 when they return to the planet. �Up, down, charmed, strange� is a reference to different types of quarks. �Praclarush Taonas� means �lost in fire.� The SGC had dialed the planet two years ago but couldn�t establish a wormhole because the gate was buried under lava flows. It is possible to use the coordinates of a gate address to calculate a planet�s position in space in order to reach it by ship. As O�Neill�s mind is overwritten by the knowledge of the Ancients, he begins speaking Ancient words, recognizes the gate symbols as spoken sounds, begins packing without knowing why, adjusts the hyperdrive crystals to increase the speed of the cargo ship, controls the Ancient chair on Praclarush Taonas, heals Bra�tac�s knife wound, modifies the transport rings, and activates the Ancient defense chair in Antarctica to destroy Anubis�s fleet. The transport rings have a limit to the thickness of solid matter they can penetrate. The transmission beam cannot penetrate a mile of solid ice. President Hayes shares information about Anubis�s impending attack with the governments of Russia, Great Britain, France, China, and Canada. President Hayes informs Kinsey that he should consider his resignation accepted. The SGC goes from DEFCON 3 to DEFCON 1. The Ancient defense chair, the zero point module crystal power source, and the glowing defense drones do not yet have official names. General John P. Jumper is the Chief of Staff of the US Air Force and a member of the Joint Chiefs of Staff in Washington, DC. Meet my maker? Pay the piper? Breach the pearly gates? Start pushing up daisies here and there? And a few days after that it�s good night, my someone, good night. It�s the perfect analogy... Burns as Goa�uld.